Some plants require winter season for flowering so called vernalization which is a key agriculture trait for crop breeding. Mechanism with molecular module for remembering winter is a key base for the molecular design for crop breeding. 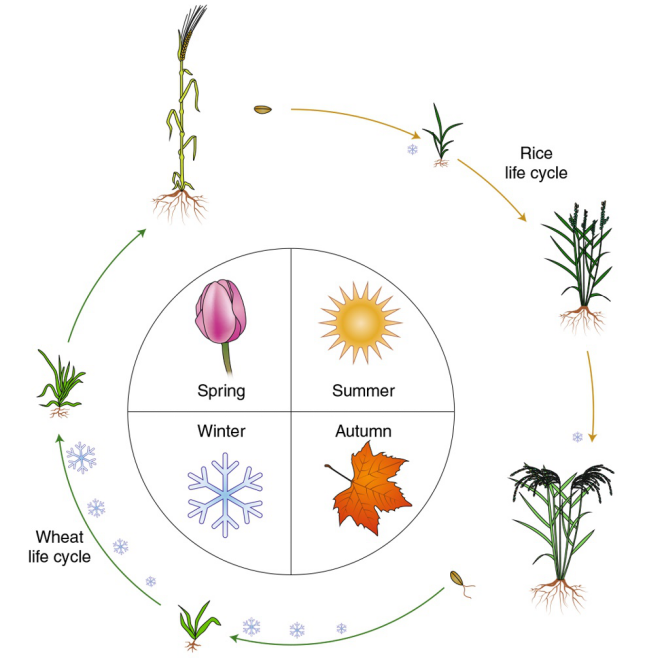 Recently, a review article entitled “Remembering winter through vernalization” from Kang Chong’s group from Institute of Botany, CAS, has been published in Nature Plants. Based on the authors’ achievements on the function of crosstalk between phosphorylation and O-GlcNAcylation on the key proteins and the epigenetic modifications of the key gene VRN1 in wheat vernalization, a fresh viewpoint for vernalization sensing as well as the potential evolutionary origins of vernalization in various species were arisen and discussed in the review article. The epigenetic-regulation and memory mechanism for vernalization have been clarified in the dicots Arabidopsis and temperate grasses wheat, barley and Brachypodium. At the same time, this article also sketches out the molecular genetic framework for vernalization in various species. This article summarizes the latest regulatory and sensing mechanisms of vernalization. As well, the article puts forward future research directions for vernalization and prospects for its applications in molecular breeding strategies. There is a distinct diversity between the genetic pathways of vernalization-mediated flowering in Arabidopsis and temperate grasses (such as wheat, barley and Brachypodium distachyon). 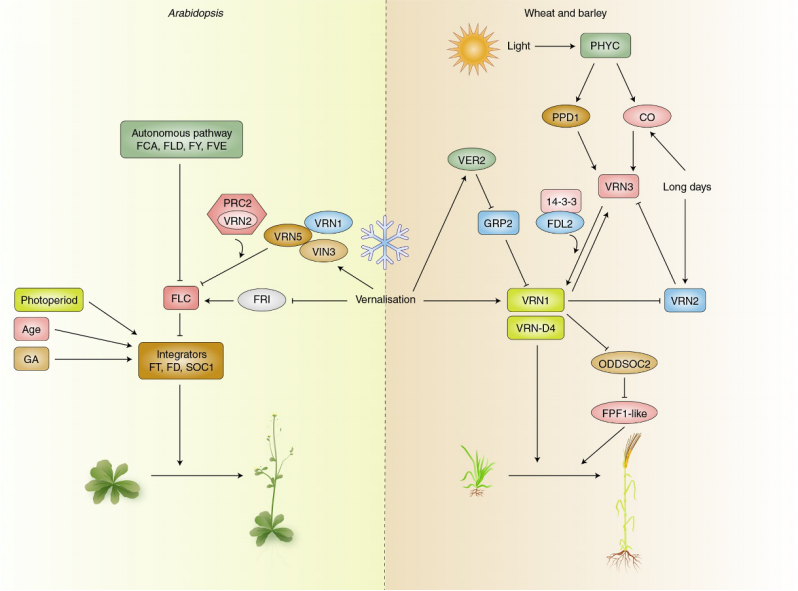 Winter cereals varieties that require vernalization express various regulatory genes in response to vernalization to adjust floral initiation, such as VRN1, VRN2 and VRN3. VRN1, encoding an AP1-like MADS-box transcription factor, is induced by vernalization and plays a crucial role in the floral transition. VER2, induced by vernalization, encodes a jacalin-like lectin with high affinity for galactose and GlcNAc. VER2 can interact with the glycine-rich RNA-binding protein GRP2 to move GRP2 from the nucleus to the cytoplasm, which repressed the specific RNA-binding function of GRP2 to RIP3 in the first intron of VRN1 in the nucleus, resulting in high levels of VRN1 transcripts upon prolonged cold exposure. And SNPs in the RIP3 motif of VRN-A1 are correlated with winter and spring growth habits in wheat, which provides a novel idea to develop wheat varieties adapting the different environments. This review article has been published in Nature Plants on November 26th, 2018 (doi.org/10.1038/s41477-018-0301-z). Dr Shujuan Xu is the first author in the article. Prof. Kang Chong is the corresponding author. The related works are supported by grants from NSFC for the basic science center program (31788103).